A native to South America. Upright growth habit with a wide crown and open canopy. Trunks are coarsely textured, dark in color and can be multi or single trunk. Leaflets are a deep green, in 9 to 30 pairs, the blades oblong, linear-oblong, linear, or linear-lanceolate, 1/4" to 1/2" long. In spring flowers are yellow-green, catkin like. In most cases the tree is thornless. 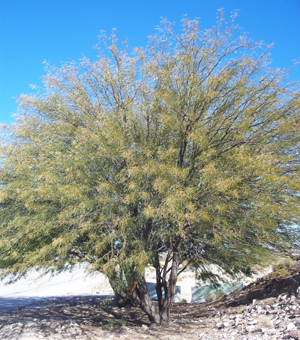 The Chilean Mesquite in not as cold hardy as other varieties.